Lillian Garcia, MTD at the South Iron yard, helped save another woman’s life a few months ago. 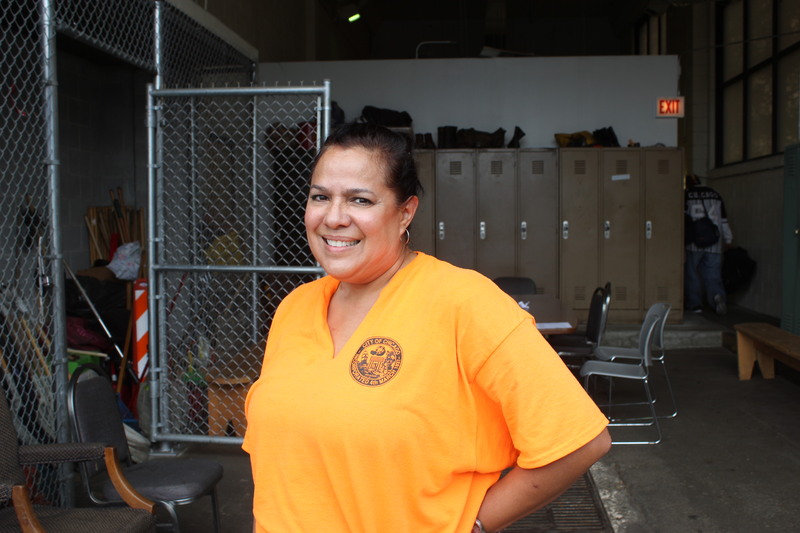 A few months ago, Streets and Sanitation Motor Truck Driver Lillian Garcia was going to lunch around 11 a.m. like she usually does. When she parked her truck near the 3200 S. Ashland block, she noticed a woman trying to jump into the middle of the street amid very heavy traffic from both directions. While Lillian was talking to the woman and attempting to calm her down, another woman, named Marie, who is part of the city Laborer’s union, was also trying to help after she saw the woman from the other side of the street. The distressed woman slipped out of Lillian’s hand and again attempted to run into the oncoming traffic. Lillian, wearing her bright yellow city shirt, walked out into the street and stopped traffic while Marie grabbed hold of the woman and brought her back to the sidewalk. Finally, the woman was with the care of the paramedics and had told them she wanted to talk to God. They discovered she lived right on the corner of the intersection when a neighbor came out and told them she had recently spent time in a mental institution. Before working at the South Iron yard, Lillian became a certified paramedic technician in 2011 and had previously worked for the University of Chicago Hospital ER. Lillian has a background in nutritional science and hopes to one day get her master’s degree in the same program. “My passion is to help people,” said Lillian. September is also known as National Suicide Prevention Awareness Month which helps promote resources and awareness around the issues of suicide prevention, how you can help others and how to talk about suicide without increasing the risk of harm. Suicidal thoughts can affect anyone regardless of age, gender or background. Suicide is the third leading cause of death among young people and is often the result of mental health conditions that effect people when they are most vulnerable. If you or someone you know is in an emergency, call The National Suicide Prevention Lifeline at 1-800-273-TALK (8255) or call 911 immediately to be connected to a skilled, trained counselor at a crisis center in your area, anytime 24/7.